With the 46th Democratic National Convention (DNC) underway in Charlotte, North Carolina, supporters of environmental action are looking at what President Obama has accomplished in his first term and by extension, what his reelection might mean for the next four years. On Tuesday September 4, Democrats opened their national convention by defending President Obama’s record and asking Americans to be patient. In their first four years in office, the Obama administration’s green efforts have been resisted by Republican obstructionism and an electorate misinformed about the science of climate change. Others have criticized Obama for not doing enough to move the green agenda forward. Despite a highly polarized political landscape, Obama has accomplished a great deal on energy and the environment. President Obama has worked to advance green jobs, electric vehicles, conservation, clean energy and efficiency. Obama has made the environment a national priority, and a primary source for job creation. The election of Obama was a radical departure from the G.W. Bush administration which was responsible for 150 actions undermining environmental protections. Obama has advanced clean energy investments and green job creation. He has created job training programs in clean technologies for displaced workers and the Green Vet Initiative to promote environmental jobs for veterans. He has dedicated $150 million for Pathways Out of Poverty green jobs training grants. Green investments in Obama’s $789 billion economic stimulus included tens of billions of dollars for green retrofits of federal-buildings. Obama also imposed greener procurement policies for government agencies. The Obama administration raised the standards for cars and light trucks for Model Years 2011-2016 to 35.5 mpg. Recently, the Obama Administration finalized new vehicle standards of 54.5 mpg that are scheduled to be implemented by 2025. This will save consumers more than $1.7 trillion at the gas pump which amounts to $8,000 over the life of a vehicle. The standard reduces US oil consumption by 12 billion barrels or 3.1 million barrels per day by 2030. It will also reduce carbon pollution by 570 million metric tons in 2030. The new standard is also a winner for automakers as it will increases their profits and create 570,000 new jobs between 2017-2025. The Obama administration has provided attractive tax credits for those who buy hybrid automobiles. The “cash for clunkers” program offered vouchers to trade in fuel inefficient, polluting old cars for new cars. Obama set the goal of one million electric vehicles in the U.S. by 2020. As a function of the President’s efforts, there will be almost 5 million charging stations by 2015. The President is also working towards the elimination of fossil fuel subsidies. On the issue of conservation, Obama has supported the Omnibus Public Land Management Act of 2009, the North American Wetlands Conservation Act and led an effort to phase out whaling. He set up partnerships to share environmental technology with other countries. He increased funding for the Land and Water Conservation Fund and national parks and forests. He allocated $175 million of ARRA for water conservation and he also worked to protect the Antarctic. Through an executive order, the President helped to protect the oceans, U.S. coasts and the Great Lakes. Another executive order established Federal Leadership in Environmental, Energy and Economic Performance. He also signed an Executive order for Chesapeake Bay Protection and Restoration. Perhaps his greatest efforts have been in clean energy. As evidenced by his State of the Union addresses in 2009, 2010, 2011, and 2012, the President has been a stalwart champion of renewable energy. The budget is part of the President’s energy plan to double electricity output from clean sources by 2035. The President’s goal is produce 80 percent of U.S. electricity from clean sources by 2035. Obama is the first President to have a detailed vision for a clean energy economy. Renewable energy has grown dramatically under the Obama administration. Under Obama’s stewardship, wind power has grown by 39 percent and he proposed a national renewable portfolio standard which would require that energy plants produce 15 percent of their energy from renewable sources. Through the EPA, The Obama administration has enacted regulations on new power plants that make it harder to build new highly polluting coal-fired plants. The President has worked to make the clean energy tax credits permanent. He has established an Energy Partnership for the Americas and a program to convert manufacturing centers into clean technology leaders. The President has doubled federal spending for research on clean fuels and invested $60 billion in tax incentives for renewable and clean energy. He has invested in all types of alternative energy, increased funding for the Environmental Protection Agency and invested $2 billion in solar power. 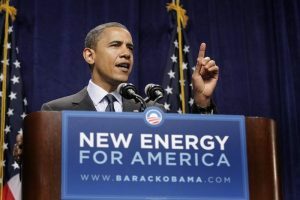 Obama has overseen the first release of a smart grid framework. He gave farmers incentives to use more renewable energy and be more energy efficient. Recently Obama signed an executive order focused on efficiency that sets a national goal of 40 GW of new combined heat and power (CHP) by the end of 2020. $2.3 billion would go towards research and development for energy efficiency, advanced vehicles and biofuels. $522 million increase in renewable energy sources and an additional $174 million for a revamped industrial technology-advanced manufacturing program. $12 million would go towards multi-year research investments in safer natural gas infrastructure in order to reduce risks associated with hydraulic fracturing in shale formations. Pipeline safety would receive a 70 percent, or $64 million, increase. Approximately $1 billion for energy conservation efforts in the Department of Defense (DOD), which is the world’s largest energy consumer. DOD is increasing its commitment to renewable energy, which now makes up 8.5 percent of its energy production and procurement. $174 million for sustainable fisheries work by the National Oceanic and Atmospheric Administration, which supports the science and management needed to support the commercial fishing industry that supports 1 million jobs and yields more than $32 billion in income every year. $28 million for the National Catch Share Program, a critical part of the nation’s strategy to return its fisheries to abundance. $47 billion for high-speed rail. $66 million for air quality programs to help states meet new regulations. $5 million to hire more inspectors for high-risk oil and chemical plants. $450 million to preserve public lands. $28 million for new inspectors. While the President is investing millions in America, Big Oil is spending millions to try to unseat him. The Koch funded Americans for Prosperity (AFP) has launched an aggressive tour to try to denigrate the President’s accomplishments. President Obama has been a champion of the environment over the last four years and if he succeeds in his reelection bid in 2012, we can expect a great deal more. Richard Matthews is a consultant, eco-entrepreneur, green investor and author of numerous articles on sustainable positioning, eco-economics and enviro-politics. He is the owner of The Green Market Oracle, a leading sustainable business blog and one of the Web’s most comprehensive resources on the business of the environment. Find The Green Market on Facebook and follow The Green Market’s twitter feed.